I have finally found some time to write this blog post! I’ve been planning it since my dissertation results came out end of July; at first I wanted to just present the survey findings in a text form with lots of explanations, but then I thought, no, an infographic would be perfect. And here it is - my first infographic! It shows in a nice visual way what I found from the survey I conducted with PR professionals earlier this year. As for the dissertation, now it’s time to brag a little bit :P I was very happy about my result and the positive feedback I got – my mark was 75%, or a First as it’s called in the UK (for the ones unfamiliar with the UK grading system, here’s a simple grade chart). I consider this an achievement, first because I don’t have much practical experience in Public Relations (or more precisely, didn’t have at the time), and second because I am not native in the language I wrote the dissertation in – English, which is just another foreign language for me. So, getting to the point, below you’ll find the results of the online survey I conducted for the dissertation, which was entirely targeted at PR/Communications professionals (I have not included the participants’ profiling; however if you wish to have a look, just get in touch with me). Once again I would like to thank all survey (and interview) participants. I admit gathering enough questionnaire responses was one of the major difficulties of the project. Again, the infographic below only shows a summary of the findings, the actual results are much more detailed and in-depth as all survey questions not only had pre-determined answer options, but also open-ended questions asking for explanations, more details and opinions. Nevertheless, the following should still give you some food for thought. I would love to hear your thoughts on the findings as well as some feedback on the infographic design. 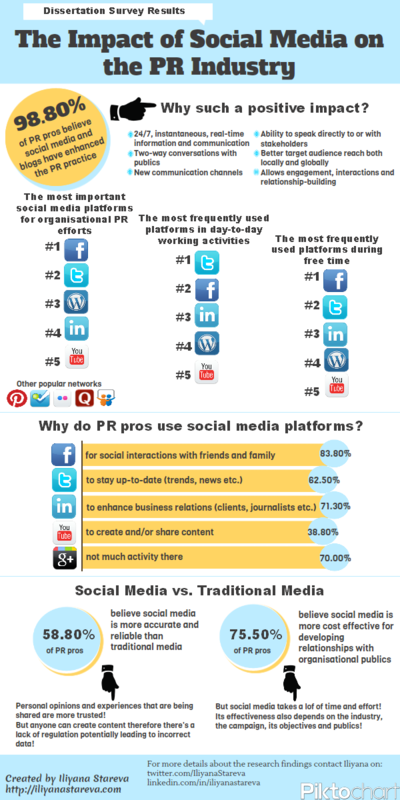 Want to know more about social media’s impact on PR? Get the book here. 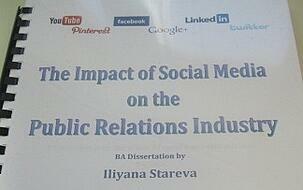 The research was published as a book called "Social Media and the Rebirth of PR". Read it now!